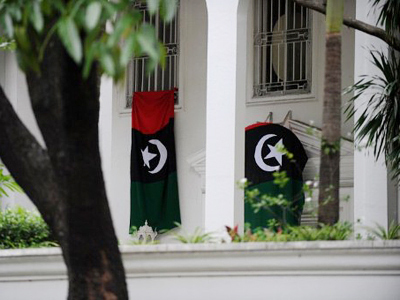 Muammar Gaddafi has been shown on Libyan loyalist TV channel Al-Orouba shortly after a group of rebels besieging apartment buildings near his Bab Al-Aziziyah compound claimed they had him trapped inside. During the broadcast Colonel Gaddafi called his supporters the "sweeping majority" and said there would be no safe place for rebels, Reuters reports. 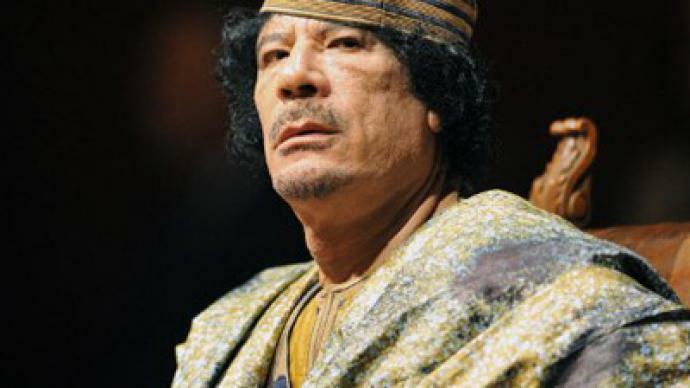 Muammar Gaddafi has told Libyans they must "fight and destroy" the rebels in Tripoli. The Libyan leader has also called on his supporters to march on Tripoli and "purify" the capital of rebels, whom he has called "rats, crusaders and unbelievers." The colonel called on all Libya's tribes to rally and to expel "foreign agents" from the country. "Libya is for the Libyan people and not for the agents, not for imperialism, not for France, not for Sarkozy, not for Italy," he said. 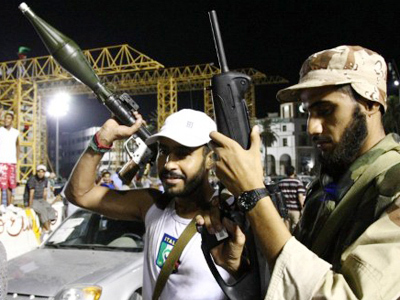 "Tripoli is for you, not for those who rely on NATO." Gaddafi’s spokesman, Moussa Ibrahim, has declared that the colonel is still in Libya and is leading the fight against the rebels. Gaddafi is safe, healthy and his morale is high, Ibrahim added. Meanwhile, a group of rebels who are exchanging fire with loyalists inside apartment buildings near Muammar Gaddafi’s Bab Al-Aziziyah compound say they believe Muammar Gaddafi is also there and that they have him surrounded, Reuters reports. The rebels did not explain why they believe Gaddafi is inside one of those apartment buildings, but they say the colonel may be holed up in the buildings with some of his sons. "They are together. They are in a small hole," the agency quotes one of the rebel fighters involved in the battle, Mohammed Gomaa, as saying . "Today we finish. Today we will end that." Occasional gun shots can be heard on a direct video transmission from Tripoli though generally the streets look pretty quiet. Libyan rebel council head Abdel Jalil urges Libyans in areas still under Gaddafi control to "join the revolution," promising national wealth will be distributed equally among the population. 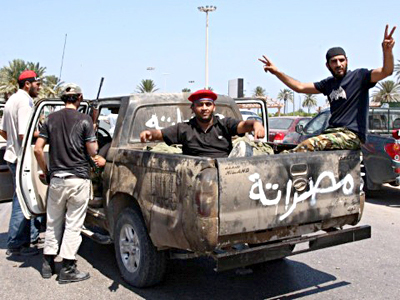 Libyan rebels say they have found large stockpiles of food, medicine and fuel hoarded by Gaddafi regime. The former pro-Gaddafi state TV station Al-Jamahiriya is now showing the flag used by the rebels – the flag of the pre-Gaddafi monarchy, BBC Monitoring reports. A text on the flag reads "Libya satellite". This, though, is not the first announcement about the possible detention of Gaddafi’s family members. On Tuesday, an announcement came that the second son of Colonel Gaddafi, Saif al-Islam Gaddafi, had been detained by rebels. 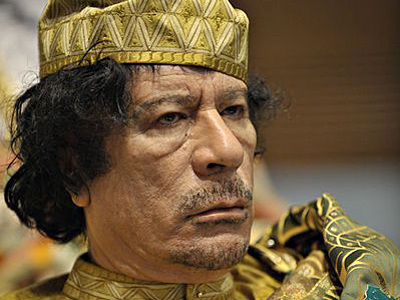 Hours after his supposed arrest, however, the younger Gaddafi rolled up to Tripoli’s Rixos hotel in a white armored limousine. Earlier in August, the rebels repeatedly claimed that another of Gaddafi’s sons, Khamis, who commanded elite loyalist troops, had been killed in a NATO strike. But Libyan state TV later broadcast what it said was footage of Khamis visiting people wounded in an air attack. 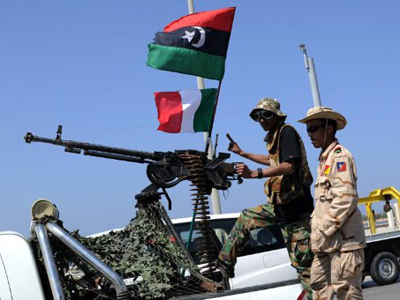 And Italian journalist Luca Galassi believes it is not by chance that these reports coincide with the visit of the head of the Libyan National Transitional Council (NTC) to Italy for talks. “What we may see is there are two conflicts going on – one is the conflict on the ground, the war that is going on on the ground between the rebels and the loyalists. And this one is probably going to end – the battle for Tripoli – is going to end in probably a predictable amount of time,” he told RT. “The other one is the economic and political conflict. This conflict is a bit more overt. So we can say for sure that these steps, like the unfreezing of the assets, are very important to try to get stabilization of the situation,” Galassi added. 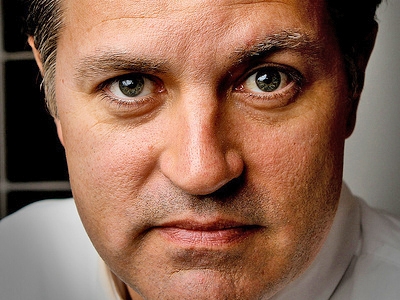 “There is a big fund that is being put up for the rebels. And in this fund, will be conveyed, will be channelled, an awful amount from all the countries that took part in this war. We must not forget that the coalition of countries that took part in the war will be the first, will be on the top. They will be the leaders who will take advantage from the cake, the big cake of oil and energy contracts. And Italy is at the forefront obviously, because it has historical reasons to be at the forefront. We have the main company, which has invested in the country and whose situation is a bit unstable also. Oilfields were stopped, as we know. So for Berlusconi it is very important to put together the biggest amount of contracts with the Transitional Council in order to have the contracts assured, in order to make the situation more stable for the company that operates in Libya,” Galassi stated. And the Libyan rebel official in charge of finance and oil says they hope to restart exports of crude oil within two weeks. Ali Tarhouni told Reuters they hope to export at least 500,000 barrels per day, growing to 1.6m barrels per day in a year or so. Damage to the oil fields has been minimal, he said. ­Mark Almond, a history professor at Oxford University, believes the timing of the rebels’ claims has not been chosen by chance. The opposition is sending out the message to the coalition forces, trying to prove they are actually worth the cash.